Chewy raisins, warm cinnamon, earthy oats, and all the goodness of the perfect chocolate chip cookie make this oatmeal cookie great! In a small bowl gently mix the flour, oats, salt, and baking soda until the ingredients are evenly distributed. Set aside. Using the wire whisk attachment of a stand mixer, cream the butter and shortening on high until light and fluffy, 1-3 minutes. Add both sugars and beat on high 1-2 minutes. Add eggs and vanilla. Beat until fully incorporated. Switch to the paddle attachment. Add the raisins and mix gently. Add the flour mixture and mix until just incorporated. Do not overmix! Touch test the dough. It should feel slightly sticky, but not much should stick to your finger. 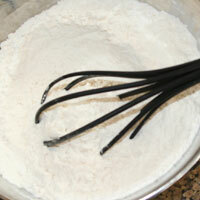 If it is very sticky add flour 2T (.5 oz) at a time. Adding the raisins before adding the flour evenly distributes them without overmixing the final dough. 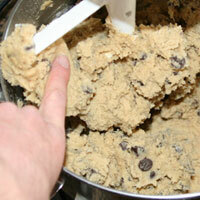 Do not over-mix or it will discolor the dough. The flour to be just incorporated, is the point when you no longer see white spots of flour. Do not overmix! Over-mixing will ruin the cookies. They will bake flatter and look greasy. See the problem section for a picture of a very over-mixed cookie. 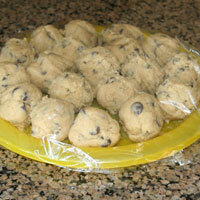 Using your hands, roll the dough into balls 1.5 inches tall (1.5 oz). (For bigger cookies click to see instructions). Place on an ungreased cookie sheet 3 inches apart. As soon as you put the dough into the refrigerator, position the oven rack to the second highest setting. Preheat the oven to 375. Remove the dough from the refrigerator and bake 8-10 minutes. They are ready to come out of the oven when they are domed and puffy, show a few signs of browning and look a bit underdone. You will be able to when you shape them if you have the fat/flour ratio right. To freeze, place the dough balls on a plate side by side, cover and freeze at least an hour. You can then bag them and they won't be stuck together when you take them out. Leave the cookies on the cookie sheet for 2 minutes. Remove them to a cooling rack so they will cool evenly. Wait ten minutes, then serve! It takes most ovens much longer to preheat than when it beeps to tell you it's ready. An oven thermometer is very helpful. When my oven beeps, it’s usually 50-100 degrees too low. It will ruin the cookies to bake them at the incorrect temperature. My oven is also calibrated incorrectly. I have to turn it to 385 degrees for it to actually be 375 degrees. It is important to wait 2 minutes before transferring them. They continue to cook from the heat of the sheet without being over-baked in the oven. Also, they will hold together better and be less likely to fall in the middle if you wait. 1. In a small bowl mix the flour, oats, salt, and baking soda until the ingredients are (1)evenly distributed. Set aside. 2. 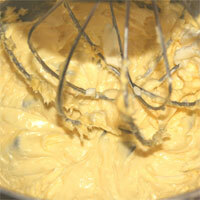 Using a wire whisk attachment of a stand mixer, (2)cream the butter and shortening on high until light and fluffy 1-3 minutes. 3. Add both sugars and beat on high 1-2 minutes. Add eggs and vanilla. Beat until fully incorporated. 4. Switch to a paddle attachment. (3)Add the raisins and mix gently. 5. Add the flour mixture and mix until (4)just incorporated. 6. Touch test the dough. It should feel slightly sticky, but not much should stick to your finger. If it is very sticky add flour 2T (.5 oz) at a time. If it is firm or dry, you have added too much flour and I donâ€™t know a good way to reverse this. 7. 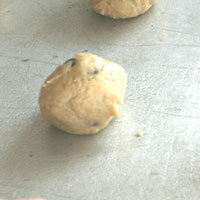 Using your (6)hands, roll the dough into balls 1.5 inches tall (for bigger cookies see instructions below). Place on an ungreased cookie sheet 3 inches apart. 8. Cover and refrigerate 30 minutes or until firm. You can hold the dough up to two days in the refrigerator or up to 6 months in the (7)freezer. 9. (8)15-20 minutes before baking, position the oven rack to the second highest setting. Preheat the oven to 375. 10. Remove the dough from the refrigerator and bake (9)8-10 minutes. They are ready to come out of the oven when they are domed and puffy, show few signs of browning and look a bit underdone. 11. Leave the cookies on the cookie sheet for (10)2 minutes. Remove them to a cooling rack so they will cool evenly. Wait ten minutes, then serve! 1. Mixing the flour allows the final dough to have an even distribution of ingredients without over-mixing it. 2. 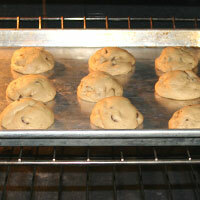 Beating the butter and shortening gives the dough a better rise in the oven, making the cookies lighter. 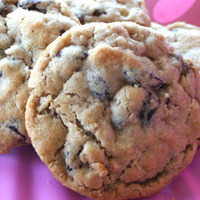 Butter is good for taste and shortening is good to make the cookie softer. 3. Adding the raisins before adding the flour evenly distributes them without overmixing the final dough. 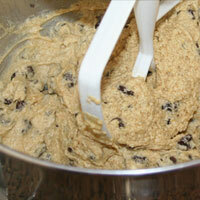 Do not over-mix or it will discolor the dough. 4. Just incorporated is the point when you no longer see white spots of flour. Do not overmix! 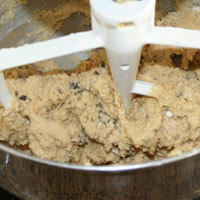 Over-mixing will ruin the cookies. They will bake flatter and look greasy. See the problem section for a picture of a very over-mixed cookie. 5. You will be able to tell at this point if you have the fat/flour ratio right. 6. 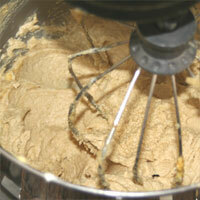 The same problems occur when over-handling the dough as over-mixing it. They will bake flat and look greasy. Handle the dough as little as possible while still shaping them properly. 7. To freeze, place the dough balls on a plate or baking sheet side by side cover and freeze at least an hour. You can then bag them and they wonâ€™t be stuck together when you take them out. 8. It takes most ovens much longer to preheat than when the oven tells you itâ€™s ready. I have an oven thermometer which is very helpful. When my oven beeps telling me itâ€™s ready, itâ€™s usually 50-100 degrees too low. It will ruin your cookies to bake them at the incorrect temperature. My oven is also calibrated incorrectly. I have to turn it to 385 degrees for it to actually be 375 degrees. 10. It is important to wait this 2 minutes. They continue to cook from the heat of the sheet without being over-cooked in the oven. Also, they will hold together better and be less likely to fall in the middle if you wait.